The Enduring Rails 2018 clinic program will feature presentations by talented modelers, authors, and experts in many areas of model railroading. The clinics will vary in presentation style and some will include hands-on learning. We've lined up presenters from all over the PCR and even a few from beyond. Whatever your interest, we'll have the clinic for you. Members of the Northwestern Pacific Railroad Historical Society will present a series of NWP-related clinics, identified by the "NWPRRHS Track" notation on the list of Clinics & Presenters that follows the QwikLinks to Presenters below. Need help designing your dream layout? How about operating your layout like the prototype? Of course, the Layout Design SIG and Operations SIG will have their usual track of layout design and operations-oriented clinics. We will be dedicating a room to these clinics to assist you in achieving your dreams. These clinics may be identified by the "LD-OPS SIG Track" notation on the list of Clinics & Presenters that follows the QwikLinks to Presenters below. If getting started with Arduino is something you’ve wanted to do, this clinic is for you! For this 2-hour clinic, we will provide an assembled and tested Arduino-based PC board. In the first portion of the clinic, after a brief introduction, we’ll provide sample programs you’ll type in, compile and download. The second portion of the clinic will tie the sample programs together, which you will modify to create a grade crossing simulator. Requirements are simple. You’ll need to bring a Windows-based computer (sorry, no MACs) loaded with the Arduino Integrated Development Environment (IDE). This is a fancy way of saying a complier. The IDE is available free of charge from https://www.arduino.cc. There is a $30 material cost for the Arduino board and cable, payable at the clinic. This is a small clinic, limited to 6 attendees for a no pressure, easy learning environment. Enduring Rails 2018 clinics will be presented Wednesday through Saturday from morning to evening. Wednesday clinics start at 1:00 PM. To find a particular presenter, subject, or word, use the "Find" command, Ctrl+F (Cmd+F for Mac users). Please note this list is subject to change without notice. See News & Updates page for the latest news. Paul Ahvenainen is a long-time member of the Korbel team and is currently their wine master. He is quite familiar with the company's rich history in lumber and sawmill activities and how they brought in a NWP spur to service their business. The Korbel brothers came west for the California Gold Rush. They stayed in San Francisco and started various businesses, as well as purchasing land in Sonoma County for a lumber business. The lumber justified a lumber mill, which required a railroad spur. The NWP railroad brought in a siding, which was a reason for a train station. If you’ve been reading about our 2018 convention in Sonoma County, you will begin to see how all our tours fit together and how we came up with the name Enduring Rails. The things that make a model railroad interesting and fun also happen to be things that help young students understand the answer to their perennial question, "Why do I have to learn all of this math?" and get engaged in the experience of learning. So many disciplines are involved: engineering,, craftsmanship, history, geology, architecture, manufacturing, commerce, electronics, communications; the list is endless. Every year my students add to and operate the in-class railroad demonstrating with their enthusiasm that the appeal of model railroading is much broader than we have come to expect. The PCR Contest Manager will provide you with tips on filling out the contest forms and how to judge contest entries for those interested in judging the PCR Contest Saturday morning. This clinic will introduce the airbrush, then move on to talk about airbrush types, and the use of Acrylic versus Enamel paints as well as the how to thin and mix paints for different applications. Next, we will cover the proper air pressure and effect of flow and mix in painting. After discussing priming models, we will talk about care and cleaning after airbrushing. Lastly, we will give an airbrush demonstration. In this clinic, Bob will present the basic history of the North Shore RR, who started it, a brief look at the SF&NP at the time of the NSRR formation, a map, lots of old photos, Marin County populations, fares, car operation and some of the hurdles they had to overcome building a third-rail line with block signals on top of an existing narrow-gauge operation. He will also show what happened to the cars after abandonment in 1941, how they looked on the Pacific Electric and their final disposition and preservation. This will be a forum type of clinic with a short PowerPoint presentation and discussion of the various aspects of signaling. Dave will share his experiences as an engineer and those of other railroad employees, along with question and answer opportunities. This clinic gives an overview of how to get started modeling Civil War railroads. How to get started, where to look for historic information and how to find rolling stock and armies. We will discuss the Northern and Southern Civil War railroads and the U.S. Military railroad and how you might determine what railroad you want to model. The ability to print small quantities of decals, i.e., for one specific car project, is one of the most sought-after capabilities for modelers. This clinic will cover the fundamentals of preparing accurate artwork for decals, and describe three technologies for printing: Laser, ALPS, and UV-LED. Featured will be new approaches to the elusive ability to print white decals. My decision to model the California Western Railroad (CWR) was made a long time ago. I have planned the layout in at least three different spaces. The current one that I am building is in a detached three car garage. My clinic will cover some history of the CWR, the construction of the garage, and the building of the model railroad inside. The history is relevant, but not a focus of my research; I am modeling a fictional CWR based on the location and features of the prototype. The construction of the building is fascinating because of the speed that it was built. The layout itself is now about 16 months old, the first and second level of track is installed and operable, the third level track work is about 50% done. The scenery is starting to move along on the lower levels, all the white plaster is covered, and some of the backdrops are painted. Several scenes are well on their way to completion. Come and visit on Friday night and Sunday afternoon to see the layout in person. The purpose of this presentation is to identify visual cues that establish the era one is modeling. This will be done mainly through examining features of rolling stock that reflect evolving rules, practices and technical developments in freight car design and construction. This presentation is designed to help you enjoy operating your trains by using my tips for making your freight cars operate more reliably. Topics to be covered include tools, techniques and materials, plus standards, wheels, trucks, couplers, suspension, weights and testing. Fred Codoni, Editor and publisher of the NWPRRHS’s bimonthly Headlight and Northwesterner magazine, is a former employee of both the NWP and the Southern Paciﬁc. He'll relate his personal experiences with unusual practices and humorous happenings on both railroads. He'll also show some of his 1950s photos of the NWP, SP and “foreign line” trains. How I designed and scratch built a working eight-shelf vertical staging system to hold eighty cars and doubles as display shelves in the crew lounge. All aspects of the trials and tribulations along the way are addressed. What worked, what didn’t and why not. This clinic describes the development and use of Special Actions & Instructions (SA&I) to enhance operations by creating additional moves/steps during ops session that would normally be made between sessions or not at all. The SA&I discussed in this clinic include: passenger ops (passenger tickets and bags of mail) , Freight ops(empty moves, livestock, reefers and LCL), and steam loco ops (fuel and water service). The clinic uses examples and samples from the author’s bedroom-sized Burney, Redding & Western home layout, showing how to increase guest operator interest and challenges even on a small layout. On March 19, 1991, a Southern Paciﬁc freight train derailed on Vandenberg Air Force Base on the Coast Line, closing it for six days. We will look at the derailment through the eyes of the responders and the clean-up crews. Are you plagued by derailments? Do you have trouble with couplers? Does your rolling stock wobble down the track? What steps can you to take to improve the reliability of your rolling stock? Come spend some time with me at this clinic as we discuss easy steps you can take to alleviate these issues. I will describe methods I use and the tools I have found helpful. Using examples and photos from our 100-year-old citrus grove and pictures from other San Joaquin Valley citrus growers, I hope to add to the work of Bob Chaparro and Jim Lancaster to provide some additional ideas about how we can improve and detail our citrus modeling. I will cover the variety of commercially-available trees, suggest ways to model the trees themselves, show examples of wind machines, smudge pots, oil storage tanks, tractors, spray rigs and other equipment you might purchase, kit-bash, repurpose, or scratch-build for your groves. (hand-outs provided). NWPRR Historical Society director and author Angelo Figone will present a program on the “boom and bust years” of the Redwood Empire’s “lifeline” railroad. From the early decisions by owner Southern Paciﬁc Railroad to invest in the railroad's infrastructure to the ongoing challenges of maintaining “the most costly railroad in the United States,” Angelo will detail the efforts and rewards during the decades, The program also recognizes the contributions of both career NWP and SP employees during this era. Discussion of NMRA developments and programs. A full Question and Answer session on the NMRA, its programs, future and outlook. Audience feedback and cheap shots are encouraged!! Your chance to tell the NMRA President how much better you could do. And who knows . . . you might get the chance !! Conversion of the abandoned NWPRR mainline between San Rafael and Santa Rosa to a modern commuter line required completely rebuilding the trackage. The mainline trackage and grade were restored to limited freight operation by NWP Co., however the wooden ties and sectional rail was unsuitable for modern passenger service and was replaced by concrete ties and continuous welded rail. NWPRRHS videographer Roger Graeber monitored and digitally recorded the process. The unloading of the welded rail and its installation on concrete ties are the subject of this video. .
How to get that perfect look on any of your models, from masking techniques to achieve color separation to getting that smooth varnish look on passenger cars to creating a regular utilitarian hard-working appearance of your steam engines. Ed is a Master Model Railroader (MMR) specializing in Southern Pacific equipment, but he can transform any model into a piece of art. 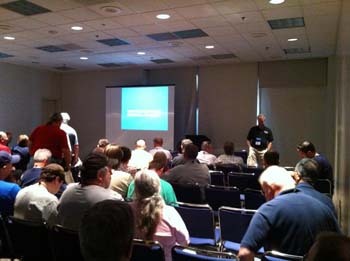 Convention attendees are encouraged to bring an idea, a model, a demonstration of a process, a small set of slides, etc. for a 5-ish minutes of sharing: a possibly new idea they have, or something they have had good experience with. We hope to encourage people to contribute in a small way, even if they don’t have enough material for a full clinic. We have one or two ideas ourselves. As model railroaders, it always makes the modeling easier when we are more familiar with the subject of our modeling. In this clinic, Pat LaTorres, a long time railfan will give out a few of his tips and tricks to tracking the Iron Horse in its native environment. He will touch on some of those things that will make the experience a bit less stressful and also give some insights on where to find the subject. While the natural range of this beast has been substantially reduced in recent years, the opportunity to catch it in the wild is still there for those that wish to make the effort. Loading racks and tank cars. Case studies of three petroleum products: ethanol, butane, and propane. Each case study looks at production of petroleum products, rail logistics and key elements that can be modeled. This presentation highlights features that make railroad and railroading in Europe different from North America. Special emphasis will be on classification, along with examples of contemporary freight wagons (freight cars) in the prototype and HO scale. This will be an introduction to the design, configuration and special capabilities of the San Francisco Bay Area ETE chapter’s HO modular system . Construction methods will be featured, as well as the AC and DC control systems, live catenary and working signals. Z scale developed in the 1970s and 1980s as mostly a novelty, with limited options. In the 21st century, it has matured into a wide variety of highly detailed equipment and accessories, competing with larger scales. It has become a viable option for those seeking model railroading solutions in limited space and is a new challenge for master model makers. This clinic will describe techniques to achieve realistic details on wood structures beyond weathering. We will focus on logical wood treatments to achieve results using quick, inexpensive procedures that are safe and easy to use. Additionally, the clinic will also show how to add peeling paint, silver gray, and raw wood weathering. Wood grain detail where appropriate and effects of Mother Nature, such as the sun, water, and dirt. Also, we'll cover how to detail rotted and sun-bleached wood and how to detail wood that has been stained rather than painted. On top of that, we will touch on how to provide details of dented, broken and burned wood, as well as wood underwater. For the last six years, we have been building small (less than 4’ x 4’) layouts in the Build a Memory NMRA program. We have used these layouts to recruit new members for the Coast Division. Three such layout have been completed thus far, 1 in HO scale and 2 in N scale. We've shown them at GTE shows and local train events and have recruited at least 3 new members to the Coast Division each year. It has been a fun project and PCR helps with expenses. This clinic will describe building the layouts and the rewards we have had from doing so. You might enjoy building one, too. Using an electronic spreadsheet to create and print timetables, waybills, signs, logos and more for your railroad. Ed has been researching and modeling one of Northern California's most historically interesting railroad districts, featuring structures that date to the late 19th/early 20th centuries. After reviewing material from last year's clinic, he will describe the construction of additional structures and details, as well as the beginning of backdrop enhancement for the entire Petaluma waterfront area. This is the third installment of a series of clinics on practices, techniques, and subjective issues involved in photographing model railroads. After a brief recap of general principles, the author will discuss the pros and cons of various types of digital cameras, as well as the ins and out of different approaches to lighting your model railroad subjects. Communications are as essential to model railroad operators as they are on the prototypes railroads. Seth presents a brief history of railroad communications and describes how to model them using a telephone system. Much of this material has appeared in the Dispatchers Office and in the Operation SIG's Compendium or Model Railroad Operations. This clinic has the latest updates and provides an opportunity to see a system first hand. Pre-registration is required at egirbovan@netzero.com. Limited to 6 persons. An opportunity for SIG members (and those interested in learning more about Layout Design and Operations — membership not required to attend) to introduce themselves and their interests. The format is a round of introductions, followed by moderated discussions on topics offered by the group. The first 90 minutes focuses on Layout Design issues and the second 90 minutes on operations issues. Bring your plans and mockups to share with the group! All convention attendees are welcome! Modernism was a significant architectural style from 1930 to 1960, yet few transition-era layouts have modernist structures except for trite offshoots, such as the Fifties drive-in or Streamlined Modern gas station. This clinic will review the visual vocabulary of modernist industrial buildings, survey available model kits, and explain an HO scale kitbashing project that yielded a realistic, effective and different modernist industry for the author’s layout, with notes on construction techniques and reference publications. From inspiration to finished model railroad, the steps involved in creating Fall Creek Branch. What worked, what didn't and how I would do it differently. 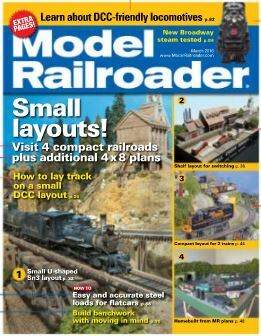 The Fall Creek Branch was featured in the March 2016 issue of Model Railroader magazine. It's amazing how much fun you can have operating a model railroad that fills an area smaller than half a sheet of plywood. We'll look at the many facets of operation, from the basics of peddler freight switching to the creation of a sequence of switching lists. This clinic will demonstrate how to use lightweight urethane foam for rock molds, terra formations and scenery. We will demonstrate how to apply the foam and how to add a scenery “top coat” for structures and landscaping. Too often I have found model railroaders whose collection and layout has created stress and unfortunate outcomes for the family, liquidator and benefactor(s) because proper planning was not in place. In this clinic I will relate stories, outcomes and provide guidance on effective tools and planning to assure the disposition of your collection and layout occurs as you wish. What does it mean to operate your (model) railroad realistically? Join Jim as he looks at the various aspects of running trains in a way that emulates the work of real railroaders. We will look at how types of trains, various jobs, era, locale and types of railroad interact to create an “operating session”. As president of Sturgeon’s Mill, Tom will touch on the history of the mill in its various locations during its lifetime. The clinic will provide background on the old steam-powered equipment you will see on Friday's tour. These include a steam donkey pulling logs, a live blacksmith’s shop, a planing shop, hit-and-miss engines, and of course, the steam-powered sawmill cutting huge logs into lumber. The Sturgeon's Mill's all-volunteer crew is skilled, knowledgeable and dedicated to taking you back in time to the steam era for a few hours. The Woodland Garden is also an extraordinary garden for visitors with its numerous beautiful trees and flowers. The mill will be open and operating just for convention guests. John Schubert, west Sonoma County Historian and Russian River Historian, delves into the rise and fall of the 12-mile Magnesite Mine railroad in the canyon country of northwest Sonoma County. The discovery of the mile-long magnesite deposits in 1905 and the demands of World War I eventually led to the construction of the two-foot gauge railroad with its turntables for its three loco, bunk houses and rotary kilns. What happened to the operation to cause its abandonment in 1922 will be discussed. The original standard gauge mainline component of the NWPRR was constructed to provide passenger and freight service between the major towns of Sonoma County and San Francisco. The railroad planned and developed service between its original railroad town of Donahue on the Petaluma Creek and its subsequent railroad town of Tiburon. It evolved into a vertically integrated system of ferryboats, railroad and toll roads, which opened the Santa Rosa Plain to development as an agricultural center, major timber producer, and tourist destination. The SF&NP operated under four distinctly different owners and management styles, which shaped its physical features and its business. Photos and maps will illustrate the history of this early transportation system. The NPC was planned and built to exploit the redwood timber resources of the Russian River. Built to 3-foot gauge, it was the ﬁrst major narrow gauge in California. Continually evolving to meet the challenges of weather, shifting terrain and business boom and bust. It also featured the mainline use of Mason bogie locomotives and its own homebuilt cab-ahead locomotive. Featuring its own ferryboat ﬂeet, a significant terminal built on a wharf, an often booming tourist, and resort business, as well as the redwood lumber business, it fostered the development of southern and coastal Marin County and the western Russian River economy. Exhaustion of the timber resources led to a sale of the NPC to the North Shore Railroad, which continued to operate the narrow gauge but added a pioneering electric commuter operation to southern Marin County. Photos and maps will illustrate the rise and fall of these lines. Sonoma County was dotted with small sawmills, which moved location each time their captive timber resources were exhausted. As built, the NPC gradually reached most of the larger and more important mills and significant towns that also developed, some of which became tourist resorts. The original goal was Duncan‘s Mill on the Russian River. As local timber resources became exhausted, the NPC built branches west to mills at Markham and Willow Creek and subsequently north to Cazadero. This presentation will use maps and photos to follow the development of these branches. Photos and maps will illustrate the boom and bust cycle of the lumber business. NWPRR Historical Society President Charlie Siebenthal will relate the history of the Sonoma Valley Railroad and both its predecessor and successor companies. Originally envisioned as the prototype prismoidal railroad, it was built as a 3-foot narrow gauge to connect San Francisco with the resort towns of Sonoma and Glen Ellen. Connection with the San Francisco & North Pacific resulted in conversion to standard gauge and operated as the Sonoma Valley branch of the NWP until the 1930s. Construction of the Southern Pacific line to Santa Rosa subsequently resulted in the two lines sharing an interchange and eventually a physical connection with the NWP at Santa Rosa. Retired engineer for Southern Paciﬁc and AMTRAK, Clark Stewart will explain how he became interested in railroads and what schooling and training was required for him to become an engineer. He will also talk about what the job of an engineer involves and some of his career experiences. No, this clinic isn't about waybills (except in passing), it's about freight traffic, and the point is that the needs of traffic give rise to waybills, not the other way around. The starting point to create realistic traffic flow on a layout is understanding each layout industry, then generating traffic patterns to serve each industry's needs. One can then add as much detail as desired, drawn from knowledge of each industry type, and resources to do so will be described. Examples from a wide range of industries are included as illustrations. Six years, or so, ago, Richard Hendrickson and I put together a clinic with this title. This new version modernizes and updates it, but, as always, making freight car models more or less weathered and dirty is essential for prototypical realism. This clinic emphasizes that there is a wide range of techniques for weathering. Several entirely different approaches, all of which work very well, will be presented and illustrated. These can be used singly or together, and viewers will be encouraged to develop their own combination of techniques for weathering models realistically. Do you want to present a clinic? If you would like to present a clinic at Enduring Rails 2018, contact the Clinics Co-Chairs. We'd love to hear from you! Thanks in advance! See you in Rohnert Park.